shoelh, F., golabchi, M., haji yakhchali, S. (2019). A conceptual framework of contextual factors affecting knowledge transfer using meta-synthesis method. 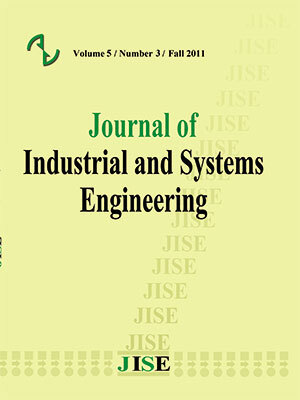 Journal of Industrial and Systems Engineering, 12(2), 9-30.
fariba shoelh; mahmoud golabchi; siamak haji yakhchali. "A conceptual framework of contextual factors affecting knowledge transfer using meta-synthesis method". Journal of Industrial and Systems Engineering, 12, 2, 2019, 9-30.
shoelh, F., golabchi, M., haji yakhchali, S. (2019). 'A conceptual framework of contextual factors affecting knowledge transfer using meta-synthesis method', Journal of Industrial and Systems Engineering, 12(2), pp. 9-30.
shoelh, F., golabchi, M., haji yakhchali, S. A conceptual framework of contextual factors affecting knowledge transfer using meta-synthesis method. Journal of Industrial and Systems Engineering, 2019; 12(2): 9-30. Since knowledge is currently considering as one of the most critical resources in organizations, knowledge management has an essential role in organizational success. Recently knowledge transfer has become a fast, growing, innovative, and essential research theme in the management domain. This paper proposes a comprehensive framework to have effective knowledge transfer in projects, especially transactional projects. We firstly explore, verify, and map out the key factors affecting knowledge transfer in organizations within the last decade. Secondly, a meta-synthesis approach is conducted by adopting “Wash and Downe’s” seven-step method to determine the relevant, vital factors. We identify thirty-nine effective factors classified into four categories named individual, organizational, technological, and transnational factors. The first three types of factors are effective for knowledge transfer in any projects; however, transnational factors are involved primarily in transnational projects. A breakdown structure of these factors is presented as a coherent framework. Lastly, the paper concludes with a discussion of emerging issues, new research directions, and the practical implications of knowledge transfer research. Adenfelt, M. (2010). Exploring the performance of transnational projects: shared knowledge, coordination, and communication. International Journal of Project Management, 28(6), 529-538. Adenfelt, M., & Lagerström, K. (2006). Enabling knowledge creation and sharing in transnational projects. International journal of project management, 24(3), 191-198. Ahmad, F. (2017). Knowledge sharing in a non-native language context: Challenges and strategies. Journal of Information Science, 0165551516683607. Ajmal, MM, Helo, P. (2010). Organizational culture and knowledge management: an empirical study in Finnish project-based companies, International Journal of Innovation and Learning 7 (3), 331-344. Ajmal, MM, Koskinen, KU (2008). Knowledge transfer in project-based organizations: an organizational culture perspective, Project Management Journal 39 (1), 7-15. Ajmal, MM, Kekäle, T., Takala, J. (2009). Cultural impacts on knowledge management and learning in project-based firms Vine 39 (4), 339-352. Ambos, T. C., & Ambos, B. (2009). The impact of distance on knowledge transfer effectiveness in multinational corporations. Journal of International Management, 15(1), 1-14. Asrar-ul-Haq, M., & Anwar, S. (2016). A systematic review of knowledge management and knowledge sharing: Trends, issues, and challenges. Cogent Business & Management, 3(1), 1127744. Atkins, S., Lewin, S., Smith, H., Engel, M., Fretheim, A. and Volmink, J. (2008), Conducting a meta-ethnography of qualitative literature: lessons learnt, BMC Medical Research Methodology, Vol. 8, p. 21. Bakker, M., Leenders, R. T. A., Gabbay, S. M., Kratzer, J., & Van Engelen, J. M. (2006). Is trust really social capital? Knowledge sharing in product development projects. The Learning Organization, 13(6), 594-605. Barnett-Page, E., & Thomas, J. (2009). Methods for the synthesis of qualitative research: a critical review. BMC medical research methodology, 9(1), 59. Bartol, K. M., & Srivastava, A. (2002). Encouraging knowledge sharing: The role of organizational reward systems. Journal of Leadership & Organizational Studies, 9(1), 64-76. Bengoa, D. S., Czinkota, M. R., Kaufmann, H. R., & Schrader, M. F. (2015). A concerted effort to transfer knowledge within European MNCs. European Journal of International Management, 9(3), 288-305. Bresman, H., Birkinshaw, J., & Nobel, R. (2010). Knowledge transfer in international acquisitions. Journal of International Business Studies, 41(1), 5-20. Britten, N., Campbell, R., Pope, C., Donovan, J., Morgan, M., & Pill, R. (2002). Using meta-ethnography to synthesize qualitative research: A worked example. Journal of Health Services Research & Policy, 7, 209–215. Cheng, T., Tai, M., & Chen, M. (2008, October). The influence factors of knowledge transfer in project management: An empirical survey. In Wireless Communications, Networking and Mobile Computing, 2008. WiCOM'08. 4th International Conference on (pp. 1-7). IEEE. Chennamaneni, A., Teng, J. T., & Raja, M. K. (2012). A unified model of knowledge sharing behaviours: theoretical development and empirical test. Behaviour & Information Technology, 31(11), 1097-1115. Connelly, C. E., & Kevin Kelloway, E. (2003). Predictors of employees’ perceptions of knowledge sharing cultures. Leadership & Organization Development Journal, 24(5), 294-301. Dawes, S. S., Gharawi, M. A., & Burke, G. B. (2012). Transnational public sector knowledge networks: Knowledge and information sharing in a multi-dimensional context. Government Information Quarterly, 29, S112-S120. De Vries, R. E., Van den Hooff, B., & de Ridder, J. A. (2006). Explaining knowledge sharing: The role of team communication styles, job satisfaction, and performance beliefs. Communication research, 33(2), 115-135. Dobrai, K., Farkas, F., Karoliny, Z., & Poór, J. (2012). Knowledge transfer in multinational companies–evidence from Hungary. Acta Polytechnica Hungarica, 9(3), 149-161. Drucker, P. F. (1999). Knowledge-worker productivity: The biggest challenge. The Knowledge Management Yearbook 2000–2001, 266–299. Duan, Y., Nie, W., & Coakes, E. (2010). Identifying key factors affecting transnational knowledge transfer. Information & management, 47(7), 356-363. Fahimeh, B., & Kermani, Z. J. (2011). Knowledge sharing behavior influences: a case of Library and Information Science faculties in Iran. Malaysian Journal of Library & Information Science, 16(1), 1-14. Fletcher-Chen, C. (2015). Impact of language diversity and social interaction on knowledge transfer. US-China Education Review, 5(3), 159-180. Fong Boh, W., Nguyen, T. T., & Xu, Y. (2013). Knowledge transfer across dissimilar cultures. Journal of Knowledge Management, 17(1), 29-46. Ford, D. (2001), Trust and knowledge management: the seeds of success, Queen’s KBE Center for Knowledge-Based Enterprises, Queen’s University, Kingston, ON, Canada, available at: http://business.queensu.ca/knowledge/workingpapers/working/working_01-08.pdf (accessed 26 August 2004). Foss, NJ & Pedersen, T (2002), Transferring knowledge in MNCs: The role of sources of subsidiary knowledge and organizational context. Journal of International Management, vol 8, no. 1, pp. 49-67. Frey, P., Lindner, F., Muller, A., & Wald, A. (2009, January). Project Knowledge Management Organizational Design and Success Factors-An Empirical Study in Germany. In System Sciences, 2009. HICSS'09. 42nd Hawaii International Conference on (pp. 1-14). IEEE. Gang, Q., & Bosen, L. (2010, May). Research on model of knowledge transfer in outsourced software projects. In E-Business and E-Government (ICEE), 2010 International Conference on (pp. 1894-1899). IEEE. Gopal, J., Sangaiah, A. K., Basu, A., & Reddy, C. P. (2015). Towards identifying the knowledge codification effects on the factors affecting knowledge transfer effectiveness in the context of GSD project outcome. In Emerging ICT for Bridging the Future-Proceedings of the 49th Annual Convention of the Computer Society of India (CSI) Volume 1 (pp. 611-620). Springer, Cham. Grant, R. M., (1996). Prospering in dynamically-competitive environments: Organizational capability as knowledge integration, Organization Science (7:4), 1996a, pp. 375-378. Grevesen, C. W., & Damanpour, F. (2007). Performance implications of organisational structure and knowledge sharing in multinational R&D networks. International Journal of Technology Management, 38(1-2), 113-136. Hamid, N. A. A., & Salim, J. (2010, March). Exploring the role of transactive memory system (TMS) for knowledge transfer processes in Malaysia E-government IT outsourcing. In Information Retrieval & Knowledge Management, (CAMP), 2010 International Conference on (pp. 303-309). IEEE. Hanisch, B., Müller, A., Lindner, F., Wald, A., (2009). Knowledge management in temporary project environments. Journal of Knowledge Management 13 (4), 148–160. Hassandoust, F., Logeswaran, R., & Farzaneh Kazerouni, M. (2011). Behavioral factors influencing virtual knowledge sharing: theory of reasoned action. Journal of Applied Research in Higher Education, 3(2), 116-134. Hasty, B. K., Massey, A. P., & Brown, S. A. (2006). Role-based experiences, media perceptions, and knowledge transfer success in virtual dyads. Group Decision and Negotiation, 15(4), 367-387. Hinds, P. J., Patterson, M., & Pfeffer, J. (2001). Bothered by abstraction: The effect of expertise on knowledge transfer and subsequent novice performance. Journal of Applied Psychology, 86(6), 1232-1243. Hu, Y., & Xue, L. (2010). The Knowledge Transfer Factors under Different Perspectives. In E-business Technology and Strategy (pp. 171-179). Springer, Berlin, Heidelberg. Inkpen, A. C., & Tsang, E. W. (2005). Social capital, networks, and knowledge transfer. Academy of management review, 30(1), 146-165. Ismail Al-Alawi, A., Yousif Al-Marzooqi, N., & Fraidoon Mohammed, Y. (2007). Organizational culture and knowledge sharing: critical success factors. Journal of knowledge management, 11(2), 22-42. Jasimuddin, S. M., Li, J., & Perdikis, N. (2015). Linkage between geographic space and knowledge transfer by multinational enterprises: a structural equation approach. The Annals of Regional Science, 54(3), 769-795. Jensen, L. A., & Allen, M. N. (1994). A synthesis of qualitative research on wellness- illness. Qualitative Health Research, 4, 349–369. Jonsson, A., & Kalling, T. (2007). Challenges to knowledge sharing across national and intra-organizational boundaries: case studies of IKEA and SCA Packaging. Knowledge Management Research & Practice, 5(3), 161-172. Kayes, D. C., Kayes, A. B., & Yamazaki, Y. (2005). Essential competencies for cross-cultural knowledge absorption. Journal of Managerial Psychology, 20(7), 578-589. Kepreotes, E. (2009). The Metasynthesis: Reducing the Isolation of Qualitative Research. HNE Handover: For Nurses and Midwives, 2(1). Killingsworth, B., Xue, Y., & Liu, Y. (2016). Factors influencing knowledge sharing among global virtual teams. Team Performance Management, 22(5/6), 284-300. Kim, S., & Lee, H. (2006). The impact of organizational context and information technology on employee knowledge‐sharing capabilities. Public administration review, 66(3), 370-385. Kogut, B., & Zander, U. (1992). Knowledge of the firm, combinative capabilities, and the replication of technology. Organization Science, 3, 383–397. http://dx.doi.org/10.1287/orsc.3.3.383. Koskinen, K., Pihlanto, P., (2008) Knowledge Management in Project-based Companies an Organic Perspective. Palgrave Macmillan, New York. Liang, H., Xue, Y., Ke, W., & Wei, K. K. (2010). Understanding the influence of team climate on IT use. Journal of the Association for Information Systems, 11(8), 414. Liebowitz, J., & Megbolugbe, I. (2003). A set of frameworks to aid the project manager in conceptualizing and implementing knowledge management initiatives. International Journal of Project Management, 21(3), 189-198. Liebowitz, J. (2004). A knowledge management strategy for the Jason organization: A case study. Journal of Computer Information Systems, 44(2), 1-5. Lucas, L. M. (2006). The role of culture on knowledge transfer: the case of the multinational corporation. The Learning Organization, 13(3), 257-275. Makela, K., Kalla, H. K., & Piekkari, R. (2007). Interpersonal similarity as a driver of knowledge sharing within multinational corporations. International Business Review, 16(1), 1-22. Chicago. Matschke, C., Moskaliuk, J., Bokhorst, F., Schümmer, T., & Cress, U. (2014). Motivational factors of information exchange in social information spaces. Computers in Human Behavior, 36, 549-558. Mays, N., Pope, C., & Popay, J. (2005). Systematically reviewing qualitative and quantitative evidence to inform management and policy-making in the health field. Journal of health services research & policy, 10(1_suppl), 6-20. Mei, C., Tiexin, C., & Hongqin, W. (2007, November). A context-based model of knowledge transferring in project management. In Grey Systems and Intelligent Services, 2007. GSIS 2007. IEEE International Conference on (pp. 1465-1469). IEEE. Mian, A., Takala, J., & Kekale, T. (2008, July). Role of organizational culture for knowledge sharing in projects. In Management of Engineering & Technology, 2008. PICMET 2008. Portland International Conference on (pp. 962-968). IEEE. Michailova, S., & Minbaeva, D. B. (2012). Organizational values and knowledge sharing in multinational corporations: The Danisco case. International Business Review, 21(1), 59-70. Michailova, S., Mustaffa, Z. (2011), Subsidiary Knowledge Flows in Multinational Corporations: Research Accomplishments, Gaps, and Opportunities. Journal of World Business, doi: 10.1016/j.jwb.2011.05.006 2011, 14 pages. Mu, J., Peng, G., & Love, E. (2008). Interfirm networks, social capital, and knowledge flow. Journal of knowledge management, 12(4), 86-100. Mueller, J. (2012). Knowledge sharing between project teams and its cultural antecedents. Journal of Knowledge Management, 16(3), 435-447. Mukkamala, A. M., & Razmerita, L. (2014). Which factors influence the adoption of social software? An exploratory study of indian information technology consultancy firms. Journal of Global Information Technology Management, 17(3), 188-212. Noblit, G. W., & Hare, R. D. (1988). Meta-ethnography: Synthesizing qualitative studies (Vol. 11). Sage Publications, London. Nonaka, I., & Takeuchi, H. (1995). The knowledge-creating company: How Japanese companies create the dynamics of innovation. New York, NY: Oxford University Press. Noorderhaven, N., & Harzing, A. W. (2009). Knowledge-sharing and social interaction within MNEs. Journal of International Business Studies, 40(5), 719-741. Nooshinfard, F., & Nemati-Anaraki, L. (2014). Success factors of inter-organizational knowledge sharing: a proposed framework. The Electronic Library, 32(2), 239-261. Omar Sharifuddin Syed-Ikhsan, S., & Rowland, F. (2004). Knowledge management in a public organization: a study on the relationship between organizational elements and the performance of knowledge transfer. Journal of knowledge management, 8(2), 95-111. Ordóñez de Pablos, P. (2006). Transnational corporations and strategic challenges: An analysis of knowledge flows and competitive advantage. The Learning Organization, 13(6), 544-559. Paroutis, S., & Al Saleh, A. (2009). Determinants of knowledge sharing using Web 2.0 technologies. Journal of knowledge management, 13(4), 52-63. Pérez-Nordtvedt, L., Kedia, B. L., Datta, D. K., & Rasheed, A. A. (2008). Effectiveness and efficiency of cross‐border knowledge transfer: An empirical examination. Journal of management Studies, 45(4), 714-744. Pina, P., Romão, M. and Oliveira, M. (2013), “Using benefits management to link knowledge management to business objectives”, Vine, Vol. 43 No. 1, pp. 22-38. Qi, L., Wang, K., & Ma, Z. (2010, May). Antecedent Factors of Knowledge Sharing in Project Teams: Evidence from Chinese Construction Sector. In E-Business and E-Government (ICEE), 2010 International Conference on (pp. 1764-1768). IEEE. Raab, K. J., Ambos, B., & Tallman, S. (2014). Strong or invisible hands? –Managerial involvement in the knowledge sharing process of globally dispersed knowledge groups. Journal of World Business, 49(1), 32-41. Razmerita, L., Kirchner, K., & Nielsen, P. (2016). What factors influence knowledge sharing in organizations? A social dilemma perspective of social media communication. Journal of Knowledge Management, 20(6), 1225-1246. Šajeva, S. (2007). An Investigation of Critical Barriers to Effective Knowledge Management. Social Sciences (1392-0758), 58(4). Sandelowski, M. and Barroso, J. (2007), Handbook for Synthesizing Qualitative Research, Springer Publishing Company." Schlegelmilch, B. B., & Chini, T. C. (2003). Knowledge transfer between marketing functions in multinational companies: a conceptual model. International Business Review, 12(2), 215-232. Schomaker, M. S., & Zaheer, S. (2014). The role of language in knowledge transfer to geographically dispersed manufacturing operations. Journal of International Management, 20(1), 55-7. Spender, J. C., & Grant, R. M. (1996). Knowledge and the firm: Overview. Strategic Management Journal, 17, 5–9. Sunaoshi, Y., Kotabe, M., & Murray, J. Y. (2005). How technology transfer really occurs on the factory floor: a case of a major Japanese automotive die manufacturer in the United States. Journal of World Business, 40(1), 57-70. Tong, Y., & Nengmin, W. (2009, July). The Model and Strategy of Knowledge Transfer in Project Environments. In Services Science, Management and Engineering, 2009. SSME'09. IITA International Conference on (pp. 120-123). IEEE. Urquhart, C. (2010). Systematic reviewing, meta-analysis and meta-synthesis for evidence-based library and information science. Information Research, 15(3), 15-3. Van den Hooff, B., & Huysman, M. (2009). Managing knowledge sharing: Emergent and engineering approaches. Information & management, 46(1), 1-8. Walsh, D., & Downe, S. (2005). Meta‐synthesis method for qualitative research: a literature review. Journal of advanced nursing, 50(2), 204-211. Ward, J., & Aurum, A. (2004). Knowledge management in software engineering-describing the process. In Software Engineering Conference, 2004. Proceedings. 2004 Australian (pp. 137-146). IEEE. Wasko, M. M., & Faraj, S. (2005). Why should I share? Examining social capital and knowledge contribution in electronic networks of practice. MIS quarterly, 35-57. Welch, D. E., & Welch, L. S. (2008). The importance of language in international knowledge transfer. Management International Review, 48(3), 339-360. Wickramasinghe, V., & Widyaratne, R. (2012). Effects of interpersonal trust, team leader support, rewards, and knowledge sharing mechanisms on knowledge sharing in project teams. Vine, 42(2), 214-236. Willem, A., & Buelens, M. (2009). Knowledge sharing in inter-unit cooperative episodes: The impact of organizational structure dimensions. International Journal of Information Management, 29(2), 151-160. Wu, W. L., Hsu, B. F., & Yeh, R. S. (2007). Fostering the determinants of knowledge transfer: a team-level analysis. Journal of Information Science, 33(3), 326-339. Wu, W. L., Lin, C. H., Hsu, B. F., & Yeh, R. S. (2009). Interpersonal trust and knowledge sharing: Moderating effects of individual altruism and a social interaction environment. Social Behavior and Personality: an international journal, 37(1), 83-93. Yahyapour, S., Shamizanjani, M., & Mosakhani, M. (2015). A conceptual breakdown structure for knowledge management benefits using meta-synthesis method. Journal of Knowledge Management, 19(6), 1295-1309. Yang, C., & Chen, L. C. (2007). Can organizational knowledge capabilities affect knowledge sharing behavior?, Journal of information science, 33(1), 95-109. Yeow, P., & Blazjewski, S. (2007). Knowledge and Innovation: Opportunities and Challenges to Knowledge Transfer between Multinationals and their Subsidiaries. Young, J.M. and Solomon, M.J. (2009), How to critically appraise an article, Nature Clinical Practice Gastroenterology & Hepatology, Vol. 6 No. 2, pp. 82-91.
Zimmer, L. (2006), Qualitative meta-synthesis: a question of dialoguing with texts, Journal of Advanced Nursing, Vol. 53 No. 3, pp. 311-318.